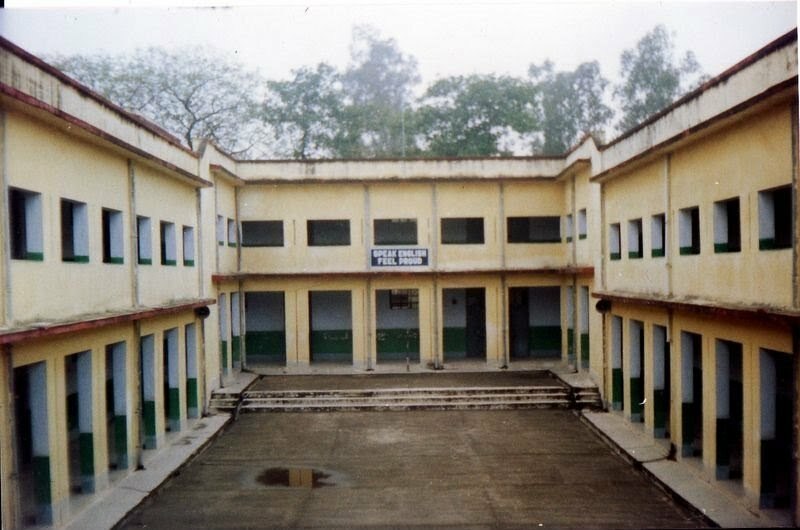 That’s the senior section of my school, De Nobili School, Mugma. A junior had uploaded this picture on his Orkut profile and I couldn’t stop myself from being transported to those old days. At the extreme left was my first classroom in this building. Until 5th, we were housed in a smaller building. My elder brothers recounted exotic tales from this building, and I was eager to graduate fast to 6th standard. And when I entered 6th class, the feeling was the same as entering college; I suddenly felt as if I was no longer a small boy. At the centre was where prayer services were held. You had to be there before the gates closed. Being late often meant a big lecture by Sir P.T. Joseph. Running to attend the assembly sounded a better proposition. This was also where flag hoisting ceremonies were held on 15th August and 26th January. The prayer services on these particular days was a bit longer. What better proof than students passing out in the queue. There was one girl who had so often exhibited this behaviour of passing out that she was exempted from attending the assembly. Almost always, no matter whether it was Sir P.T. Joseph or T.M. Thomas, doing the honours, someone had to be called to pull the rope again to hoist the flag. The best part was when the assembly was dismissed. Of course, the five toffees each that we got was a biggest attraction of these assemblies. During recess, the assembly area again came back to life when students would come out of their classes to have lunch with friends. If it was raining, and it often rained cats and dogs here, the lunch was in the verandah- but never inside the class, which was like going back to the junior classes. On the extreme right was when we were in 7th or 8th standard. One of the classes was taken by Miss Premi George, who took English Grammar lessons for us (thanks to her and Miss Chandra that I started enjoying the language). But it often meant that only 5-6 students had the luxury to be inside the class – rest were standing outside, as a punishment. Mistakes ranged from a missed comma (,) to an all clean workbook. And one day, with nothing important to while away his time, Dharmender did the unthinkable. As one of the senior girl went inside the ladies restroom, he bolted the doors from outside. The girls restroom was just besides the place where we were made to stand. Oh I can go on recounting them as it was just yesterday that I was here…if only I could have.